What Happened to NY Fashion Week? The Mercedes-Benz Lincoln Center fashion shows produced by IMG have gradually lost their cachet. They are not what they used to be. What was new and exciting about them in the 1990's, now seems old and passé . But worse, they have become boring for a lot of us. There is no fun being there anymore. No sense of an industry getting together. And where else does the press have to pay to cover an event? The venue is like going to an airport. It is all so sterile and uninviting. Years back, there was an opening night party for all in the industry to get together; a cocktail party every afternoon/evening to network; sponsors offering all kinds of foods, goods and personal services that made everyone feel special. All of that is now very limited. Why is it gone? Because there is no reason to cater to the press. Who cares what most of them say? Hundreds of opinions, some informed and many more uninformed -- it all just so much background noise. Fashion week today is not really about what the industry thinks at all. For better or worse, the shows have purposely evolved into a form of mass entertainment in the same way as the Oscars did. Just as the red carpet hype at the Oscars overshadows the awards, the fashion shows have become secondary to all of media hype going on during the week. To put it bluntly, the media is the message and not the clothes. The question remains, does the event actually sell the clothes? A lot of major designers do not seem to think so. They recognize fashion week, as organized by IMG, is really not about them. However, technology is allowing these same designers to reach just as many people in far more exclusive and controlled settings than at a Tent where they have to share the spotlight with lesser lights. One thing about fashion, when it becomes too all encompassing it loses exclusivity. It appears anyone with the money can show at the Tents. If they have talent, all the better! FashionGPS had a cocktail party and panel discussion recently at Bumble & Bumble about the future of fashion and technology. There was a Q&A after with the audience. When a question was asked of Peter Levy, SVP Managing Director, IMG Fashion as to why so many major NY designers do not show at the Lincoln Center venues, he responded by saying that some designers can show anywhere they want. 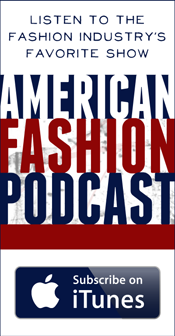 A follow-up question asked "Do you think the shows no longer have the cachet and thus many major designers feel it is better for them to show elsewhere?" There was no response. While the Lincoln Center shows are still the central focus of New York fashion week and remain "too big to fail", it has become less and less where the real fashion story is happening. More and more, it is to be found in other venues among other designers. There are over 300 shows and press events scheduled for the upcoming NY fashion shows in September, and only a minor percentage of them are showing at the Tents. And unless IMG finds new and more creative ways to instill new interest in their shows, they will continue to lose their luster. 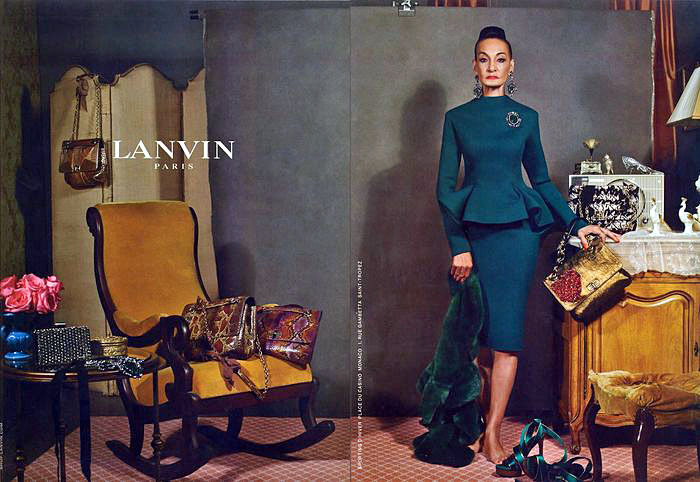 I always encourage women to hold onto as many of their favorite, great pieces (clothes, accessories) as possible; even if they are not deemed to be the height of chic, or "in" at that moment. I find it laughable when so called fashion experts extol their customers to dump anything they haven't worn for 6 months. Fashion is cyclical, everything comes back eventually, and, when it's great it's always great. This was brought into focus just recently. Case in point: Gemma Kahng's signature jackets from her first collections in the early 90's. It was a time in fashion that was all about the power suit, and Gemma's interpretations had a "chic sense of humor" in the words of Elle Magazine's Joe Zee. They were marked by fitted shapes, unabashed military formality, defined shoulders, and gloriously over-the-top, jewelry-like buttons. Sold in the best stores, they were featured prominently on the pages and covers of all the major fashion magazines, including Harper's Bazaar (I was her editor). FYI, this 90's design wunderkind is making a major comeback with the help of Joe Zee. Click on to http://www.gemmakahng.com/ to see what she is up to. Luckily, I had purchased and subsequently collected some of Gemma's signature jackets. Even when the pendulum would swing back to pared down minimalism (a look which is always valid and which I embrace), I refused to part with these decorative pieces for many reasons. Whenever I wore one, I would get many compliments and just seeing them in my closet would put an instant smile on my face. And while they might not always be part of my daily uniform, special pieces like these are hard to find. And yes, they are always desirable. Flash back to the beginning of May and the press preview for Schiaparelli and Prada: Impossible Conversations (http://www.metmuseum.org/ ) . I took note of one entire section ('Waist Up, Waist Down') which featured several of Schiap's iconic, embellished, evening jackets, many of which were decorated with pronounced buttons. They brought to mind my Gemma Kahng stash; I thought Aha! It was time to pull them out again! 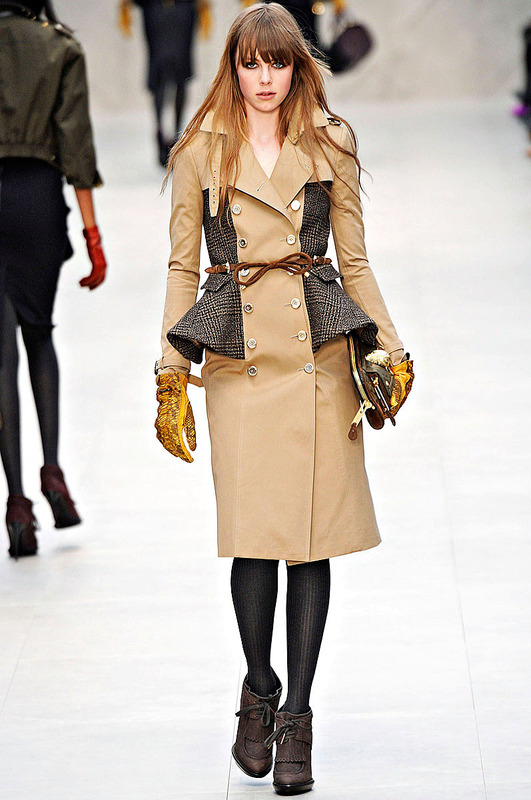 Then I read Lynn Yaeger's article in the August issue of Vogue, "Twinkle Twinkle", during the course of which the writer discusses the trend towards jeweled buttons, a recent fixation of designers like Marc Jacobs, who used "buttons the size of brooches" on jackets and coats for his most recent fall 2012 Louis Vuitton collection. The article is illustrated by several pictures of highly decorative buttons from Louis Vuitton, Thakoon, Chanel, Moschino, Oscar de la Renta, and Louis Vuitton's fall collections. I couldn't contain my delight, nor was I in the least bit surprised to see a picture (taken from Vogue 1991), of the fabulous Yasmeen Ghauri, wearing Gemma Kahng's pink and green jacket with over-sized and pink and gold flower-like buttons. It's sitting in my closet and is the exemplary piece. Ms. Yaeger questioned whether or not they should be worn by women over a certain age ("Does the bedazzled button tarnish your youth?" she asked). Of course, Ms. Yaeger basically gave her readers good reason to embrace the trend. She described the embellished buttons as "playful costume jewelry, a punctuation mark to a classic silhouette". She quoted Marc Jacobs, who observed, "The over-sized proportion and Biba-style flower motif (of his versions) kept them looking young and fresh". Lynn noted that Karl Lagerfeld (a modern thinker if ever there was one), who had the task of rethinking Chanel's signature jeweled buttons when he took over as the head designer decades ago, used diamante buttons to "cheer up" his gray flannel pieces for fall 2012 ("I love them on jeans and places where we don't expect them. That keeps them going" he explained). What are my thoughts on this matter? I think that jeweled buttons can be considered a very practical, built-in accessory. More importantly, women should stop being so obsessed with trying to look "younger" and focus on looking as good as possible and developing a signature and individual look that compliments them. I'm a firm believer than you can wear anything if you know how to wear it to its best effect. But perhaps the sentiment I agree with most, is when hip young British designer Erdem Moralioglu admitted to Ms. Yaeger that the charm in these fancy, jeweled buttons, lies in the "wrong-rightness of it". Well said. When something is SO wrong, it can be SO deliciously right. It's that whole, good taste/bad taste debate, or as Diana Vreeland once said, "Bad taste is better than no taste". So, the next time you put on a jacket or coat with dowager like, over-the-top, embellished buttons, and your first thought is, "Uh uh" -- maybe you should take a better look and say, "YES!" By the way, I'm sure I don't have to point out that you don't need to go out and buy new clothes featuring large decorated buttons; you can easily buy separate buttons and replace the boring and dull ones on your favorite jackets and coats (just be sure to hold on to the originals, just in case you change you mind). Some of my favorite places to search are M&J Trim, (http://www.mjtrim.com/ , 1008 Sixth Avenue, between 37th and 38th Streets, 1 800 9 MJTRIM), and the legendary Tender Buttons shop, 143 East 62nd Street, 212 758 7004, http://www.tenderbuttons-nyc.com/ . And naturally, you can always find distinctive, vintage buttons on EBay. I cannot recall at what point in my life I began to obsess over expressive, Picasso like faces. Though it makes perfect sense since I have long been a fan of Pablo Picasso's abstract, Cubist work: specifically, his portraits. About the only thing I love more than fashion, is art. Especially, the merging of art and fashion. 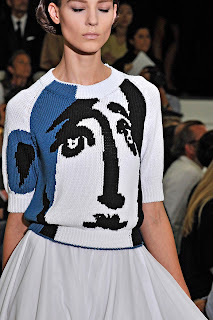 So it was not surprising, I took note when Raf Simons sent out a group of intarsia sweaters for spring 2012 which were emblazoned with Picasso inspired faces. He's not the first designer to put pronounced faces on clothing and he won't be the last. During the course of his approximately 45 year career, Jean-Charles de Castelbajac (best known for his designs which mix pop culture, bright colors, and humor), has used famous faces to decorate his designs: everyone from Mickey Mouse (Spring 2012) to President Obama (Spring 2008). Ralph Rucci (http://www.ralphrucci.com/ ) is not only a world class, award winning fashion designer, but an accomplished artist in his own right. His work is inspired by famed artists like Cy Twombly, Franz Kline, and Louise Nevelson among others. His global aesthetic, passion for collecting treasures from around the world, exotic world travels, and appreciation of diverse world cultures (specifically far Eastern cultures and Japanese symbolism), routinely find there way onto the surfaces of his designs. 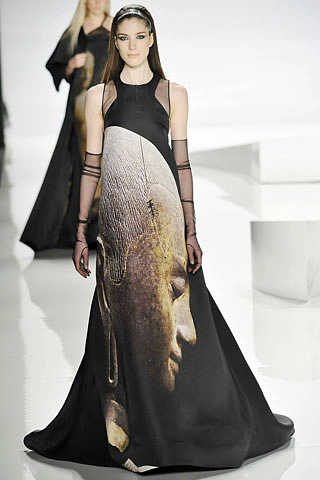 This was exemplified by several gowns from fall 2009, which were screen printed with images of the Buddha, (including one of his blown up face, which all but covered the entire surface of the dress). 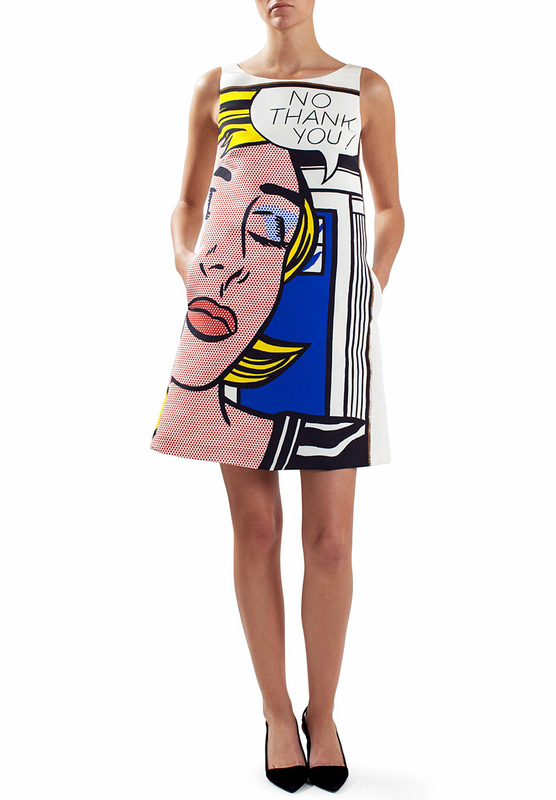 Lisa Perry's Roy Lichtenstein "No Thank You Dress"
Lisa Perry (http://www.lisaperrystyle.com/ ), is not only an avid art collector, but a fashion designer (FYI, she is the wife of Richard Perry, the hedge-fund tycoon who recently took a majority stake in Barneys New York). She has successfully combined her clean lined, space age, 60's aesthetic, with iconic pop art, as exemplified by her Limited Edition Artistic Collections which have featured the wearable art of Andy Warhol, Jeff Koons and Roy Lichtenstein. 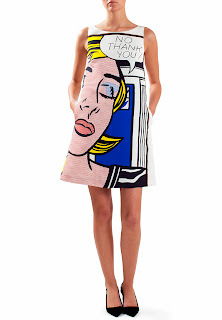 One of my favorite products is the eye popping Roy Lichtenstein "No Thank You" dress, $2000. Her flagship is located at 976 Madison Avenue, tel: 212 431 7467. 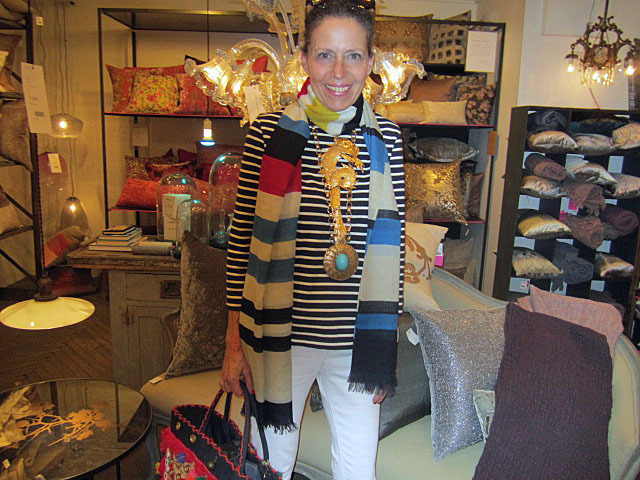 She also has a store in Sag Harbor, located at 63 Main Street, 631 725-7467. 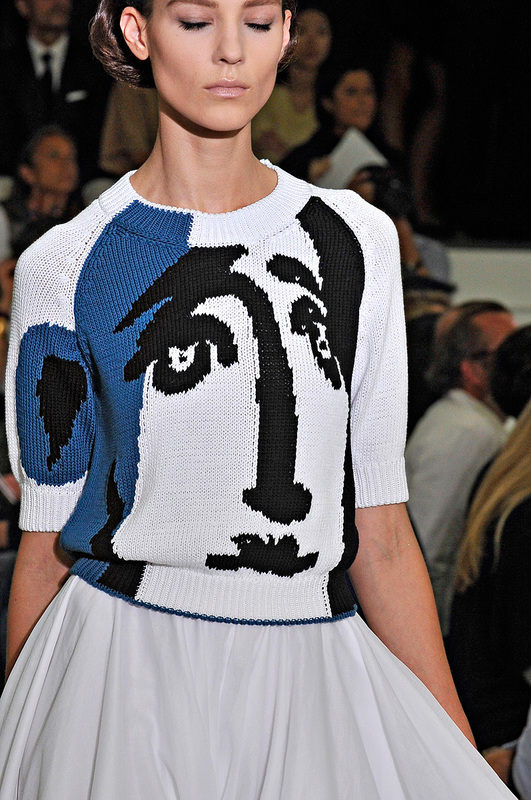 For resort 2013, Marc Jacobs included several sweaters emblazoned with his own face. But let's "face" it, not everyone may want to wear an item of clothing emblazoned with the likeness of another person (no matter how attractive, talented, iconic, important, or legendary he or she may be). 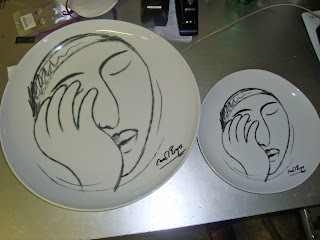 You can always satisfy your urge (should you have one) for incorporating faces into your life via products for the home. ﻿ Giovanni De Simone, who passed away in 1980, was one the greatest Italian ceramic artist who studied under Pablo Picasso. 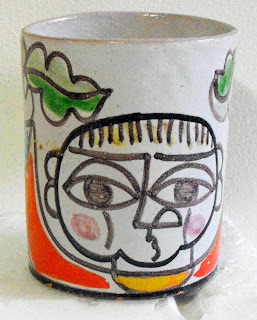 I began buying and collecting colorful Desimone pottery: mugs, espresso cups, plates (and love that no two are alike). His hand painted artistry of true Majolica pieces are famous and now produced by his daughters Susanna and Margherita De Simone. I prefer the vintage versions, especially the ones from dated 1965, and if you keep looking, you can get lucky and find them on EBay. ﻿﻿﻿﻿﻿Piero Fornasetti, was an Italian painter, sculptor, interior decorator and engraver. 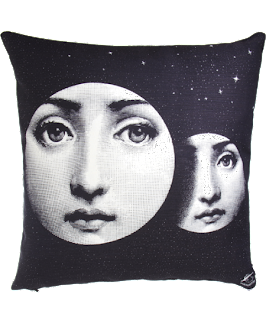 He created more than 11,000 items, many featuring the face of a woman, operatic soprano Lina Cavalieri, as a motif. 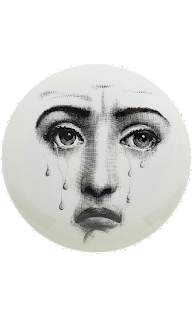 Fornasetti found her face in a 19th century magazine. “What inspired me to create more than 500 variations on the face of a woman?” asks Italian designer, Piero Fornasetti of himself. “I don’t know,” he admits, “I began to make them and I never stopped.” The “Tema e Variazioni” (theme and variation) plate series based on Cavalieri's face numbered more than 350. Other common features in his work include heavy use of black & white, the sun and time. His style is reminiscent of Greek and Roman architecture, from which he was heavily influenced. 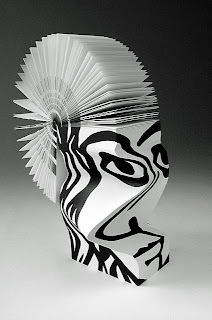 Last, but not least (thought certainly least expensive), are the malleable Picasso Head Morph Notepads, available at http://www.thelibraryshop.org/ , $15. New York Fashion Week is notoriously chaotic. Though Lincoln Center serves as the hub, there are over three hundred shows and presentations which take place all over the city often overlapping with four or five events scheduled simultaneously during any given hour. Fashion GPS to the rescue! Fashion GPS, a web-based virtual employee, started in 2006 and today organizes the fashion industry by handling the entire process of sending out and following up on samples, creating reports, managing requests, forecasting, taking reservations and displaying look books. Launched in late 2011, GPS Radar is a web and iPhone application created specifically for the fashion community. GPS Radar’s main purpose is to streamline the traditional fashion show process. Radar users are able to manage invites, map out events, create personalized look books and share them through various social media outlets. On Monday evening bloggers, PR specialists, designers and even students gathered at the House of Bumble (a lovely, airy space with huge windows and impressive views of the river) in the Meatpacking District to kick off a series of conversations initiated by Fashion GPS and to celebrate the debut of the newest features of GPS Radar. “Technology and Fashion Week,” the evening’s theme, was the first in an ongoing series which will explore the fashion industry’s connection with technology and its rapidly evolving digital demands. Parsons Dean of Fashion Simon Collins served as the evening’s moderator. 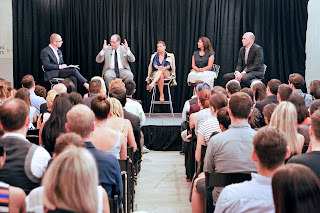 The expert panel included of some of fashion week’s key players from different arenas: Dirk Standen, Editor-in-Chief, Style.com; Peter Levy, SVP Managing Director, IMG Fashion; Jenné Lombardo, Fashion Director & Curator, Milk Studios and Milk Made; and Rachna Shah, Senior Vice President, KCD Worldwide. A hot topic of the evening was live shows versus online shows. On one hand, Lombardo felt that social media and e-commerce drove sales and, therefore, believed that digital and online were important. “Designers should be creating content and putting money into building their brand image until they get to the point when they can show,” said Lombardo. On the other hand, Standen debated that there was still something special about the live experience. “There is often a different quality that you can see live that you can’t always appreciate online,” he said. Sponsors for the event included: Bumble and bumble, in.digital, SVEDKA, fancy girl table and VOGA. With the opening ceremonies of the 30th Olympiad only days away, the world’s attention is focused on the British capital. Here is just a sampling of what London has to offer beyond the games. 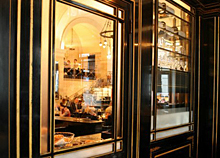 Located in what was once The Wolseley Car Company showroom, then a Barclays bank, the Wolseley is now the home of an elegant restaurant where the food, service and decor are all first rate. Come for breakfast, lunch, dinner or a traditional British afternoon tea, complete with an assortment of finger sandwiches, fruit scones and pastries, all made in house. The crowd is predictably stylish and well suited for people/celeb watching. Polish sculptor, Adam Kalinowski designed this multicolored sand installation, as part of the "Festival of the World" celebration at London's Southbank Centre, Europe's largest center for the arts, located on the South Bank of the River Thames. Visitors walk and play among the hand crafted wooden sculptures in the park, mixing the sand to create new colors. The festival runs until September 9, 2012, celebrating the power of art to transform lives. It includes the work of 4,000 artists, writers and performers from 200 countries. Occupying one full block in the busy Oxford Street shopping district, the flagship location of the British department store chain is a favorite of Londoners. The store dates back to 1864 and is a shopper's paradise, filled with everything from womenswear to food to electronics and much, much more. There is even a shop for official Olympic merchandise. 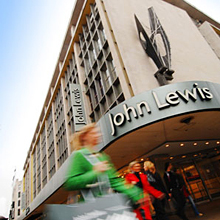 The Oxford Street store is located just a short walk from the Oxford Circus tube station. "Eat Heartily & Give The House A Good Name" is the slogan of this traditional, British gastropub that has a more "intimate" dining room upstairs. The Notting Hill establishment is owned by Terence Conran's son, Tom, and you can expect to find it crowded with locals who come for the delicious seafood, and, of course, the Guinness. These “quintessentially British” beauty products are 100% natural and contain no petrochemicals, parabens, sulphates or artificial colors or fragrances. The gels are infused with essential plant oils and the variety of scents allows you to tailor your cleansing routine to suit your mood. 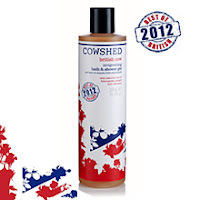 They have clever, names like Grumpy Cow, Knackered Cow, Lazy Cow or the limited edition, British Cow, celebrating the brand’s fourteen-year history. The agency, founded in 2003, is a full service public relations firm. The founder Jodi Lin Wiener is a fashion & lifestyle publicist and brand-marketing strategist. She has coordinated fashion shows and events, executed social media strategies and kicked off PR campaigns both in New York and Europe. Prior to opening her own company, she worked for Loving & Company and Gale Group. Educated in Communications, Design and Art History at both Syracuse University and the London College of Fashion. There are many things that improve with age. Wine, cheese, the Statue of Liberty, and Michelangelo's David. And us! Just consider the ageless nonagenarian Iris Apfel, the amazing and inspiring subjects spotlighted on Ari Cohen's http://www.advancedstyle.blogspot.com/ , the 60+ fashion stars of the new Lanvin Fall 2012 campaign, and the "Wonder Women from 28 to 101" profiled in the August issue of Vogue which is their annual Age Issue. Vintage Pucci: Emilio Pucci's iconic prints are all time classics - wearable art - and will always be a wonderful addition to any wardrobe (whether it takes the form of a scarf, a jersey dress, a silk or cotton blouse, a velvet jacket, etc.) 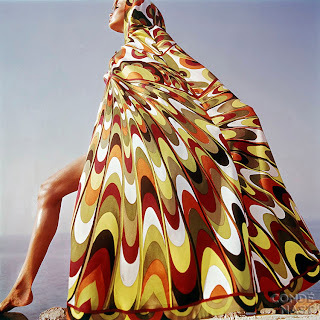 And once again, in my opinion, the patterns and colors found in the pieces from the 60's and 70's are more distinctive than anything currently out there today, and far more preferable (stains and all). There is something about the vintage patterns and colors, that cannot seem to be duplicated these days. 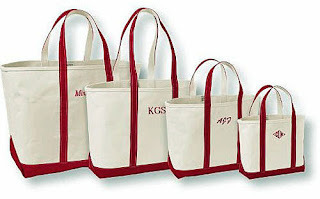 The LL Bean Canvas Boat and Tote Bag: There have been so many versions of a traditional canvas tote bag through the years (they've even been made for evening in sequins, gold, etc. ), but the original, made in Maine for over 65 years and available at www.llbean.com, cannot be beat (nor can the price: $20.95 - $38.95). They are tested to hold over 500 pounds, made of heavy duty 24 oz. cotton canvas combined with the company's signature double layer base and handles, they feature a reinforced flat canvas bottom and overlapped seams double-stitched with nylon so that they won't rot or break. They are basically indestructable. 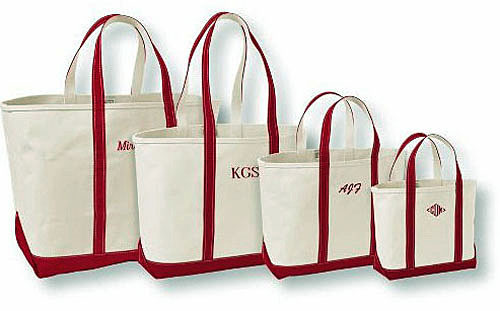 You can have them personalized, they are available in 10 colors ( including red, black, navy, and a vivid royal which is my favorite), and come in 4 sizes: from Small to Extra Large. The Aigle Rubber Riding Boot: The marketplace is literally 'flooded' with rubber rain boots in every color under the sun, with every heel height, in every style imaginable, with a range of decorations and superflous additions. 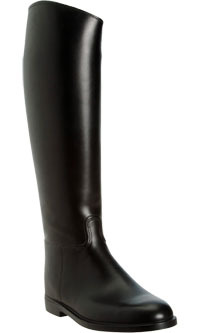 But the all time chicest, are still the traditional Aigle Rubber Riding Boots, www.aigle.com. Aigle is No. 1 worldwide for the manufacture of high quality hunting boots (Parcours model) and horseback riding boots (Ecuyer model) as well as a European leader for nautical boots (Glenan, Glenan ISO, Skey, Bora and Maramu models are topsellers).The Ecuyer model is the real deal and looks more like leather than rubber. In addition, the tall shaft height and the narrowness of the fit (they are meant to really hug the calf), make these exceptionally flattering. They are available at Barneys.com, $195, and at J.Crew (http://www.jcrew.com/ ), which is currently selling little girls' sizes. The Saint James Breton Striped T-Shirt: The striped 3/4 sleeve bateau neck top is a unisex classic that completely stands the test of time, and almost nothing is as ubiquitous, especially in the summer (it can be considered a 'neutral' that really goes with everything). 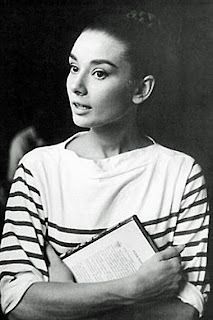 When you see images of the late Audrey Hepburn wearing hers with capris and ballet flats, it is still a look that cannot be improved upon. And nobody makes them better than the Saint James Company, (http://www.saintjames-usa.com/ ), established in Lower Normandy in 1889. The Patterned Hermes Silk Scarf: There are patterned silk scarves, and then there are Hermes patterned silk scarves. How do I love thee? Let me count the ways. They can be worn tied around the neck, tied around the handle of a bag, tied around the head to make a turban, or used to chicly camouflage a cast (remember Sigourney Weave in the move, '9 to 5'?). They can also be framed. 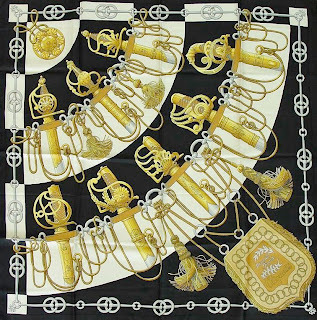 While there are millions of patterned silk scarves in the market place (many at lower prices than the original), the ones at Hermes (the company was founded in 1837), stand out because of the saturated colors, the highly distinctive prints, and the luxurious, heavy silk twill which gives it a lot of body. (And true to form, I had a fondness for vintage Hermes scarves and find that the ones I've collected, are still better than anything out there today). A Burberry Trench Coat: This iconic 156 year-old global brand with a distinctly British attitude knows a thing or two about inclement weather. Their trench coats for men and women are still the gold standard, and though their original classic bare bones style is hard to improve upon, I have to admit that Christopher Bailey's updated incarnations are always "right on the money". Fashion insiders are often on the same wave length, and accused of having a herd mentality ("Great minds think alike"?). But it's understandable why that is. After all, we are all under "the influence", so to speak. We all sit through the same fashion shows, read the same columns, and pour over the same fashion magazines. We collectively make our livings (and amuse ourselves) owing to a desire and ability to pick up on the most subtle or seismic shifts and changes in the cultural zeitgeist, and within fashion's mood. I venture to say that all of us welcome these periodic shifts and find the constant changes and fluctuations in fashion to be appealing on many levels. It's a given, that when one trend appears for awhile, there will be a shift to its polar opposite. Everything old is new again and fashion is a revolving wheel. Whenever something is absent for awhile, the novelty of it practically insures that it will seem appealing once again (absence makes the heart grow fonder). Which is why I detest when so called 'fashion experts' advise people to "throw out anything they haven't worn for 6 months" -- as if that time frame is some sort of divine rule of thumb. What a joke and how irresponsible! If fashion history proves anything, it's that it all comes back, and no, not necessarily in a different form. Nothing is ever IN or OUT. And if you buy great, distinctive items, regardless of what they are, or what category they fit into, they will always look great and can always be integrated into your wardrobe. Case in point: the so called rebirth of what is being touted as "Gypsy Chic". It's not only been spotted on some of the world's most influential runways (Givenchy and Altuzarra, among them), but on the street, AND on some of the chicest Vogue editors. It will be the focus of an editorial in the upcoming August issue of Vogue, and it was the subject of a front page article in the Thursday Styles section of The New York Times ("Joining the Gypsy Caravan", by Ruth La Ferla). Ms. La Ferla described how some of Vogue's top taste makers, such as Vogue.com's Candy Pratts Price, have recently shifted from a pared down, classic, and chicly minimalist uniform (defined by Hermes cuffs and Celine chokers), to something far more free spirited, chaotic, individualistic, and eccentric. Exemplified by an un abandoned pile on of bracelets, necklaces, and rings, as well as the unexpected clash of prints and use of strong colors. I am not in the least bit surprised that this look is gaining momentum. In the first place, everything gets old, stale, and boring after awhile, even the best fashion looks, particularly if they're unapologetically uptight and controlled. It's human nature to want to change to something that is quite the opposite. In this case, something that is less controlled, more spontaneous, and a bit eccentric. Plus, it's the summertime; a time when we all want to escape from reality and the mundane, and get away to someplace exotic, free, and easy, even if it's only in our minds. If we can't literally get away, we can at least dress the part, which is almost as good (well, sort of). There's an undeniable laid back ease and free wheeling spirit that defines elements of "Gypsy Chic", and it's easy to understand it's appeal. In the same way that Katie Holmes broke free of a restrictive marriage, many woman have the periodic desire to break free of their self imposed restrictive wardrobes. There's no better time than now. By the way, I would like to point out that Iris Apfel can be considered the poster gal for this aesthetic and there's nobody who carries it off better or with such aplomb! Coincidentally, weeks before this article was posted, and prior to the Haute Couture shows in Paris, I felt the urge to adorn my usually minimalist summer wardrobe and make it more interesting and a bit more, well, eccentric and colorful. I began by layering huge gold toned necklaces (the bigger, and nosier the better) and then I went into my closet to resurrect one of my all time favorite purchases: an enormous vintage Magid straw bag purchased on http://www.enokiworld.com/ that literally defines the essence of "Gypsy Chic". I've never seen another quite like it. It is lined in red felt, top stitched in orange thread on black trim, decorated with mirrors, colorful yarn, ribbons, metallic decals, gold coins, and it has two bells, which make it rather obnoxiously noisy whenever I move it (See photo top of article). It never fails to elicit stares and compliments (from infants to grown ups) and almost everyone comments on it and asks about its origins. I have carried it year round (it's most unexpected in the winter time) and it immediately transports me to somewhere else, and puts a smile on my face (and on the face of others). Isn't that what fashion is all about? Bold, playful, polka dots are a crowd pleasing perennial favorite, beloved by 'kids' of ALL ages. They routinely cover everything from toys and items of home decor, to accessories and clothing. And they are about to become even more popular and more ubiquitous, thanks to the new collaboration between 83 year old Japanese artist, Yayoi Kusama and Marc Jacobs for Louis Vuitton. 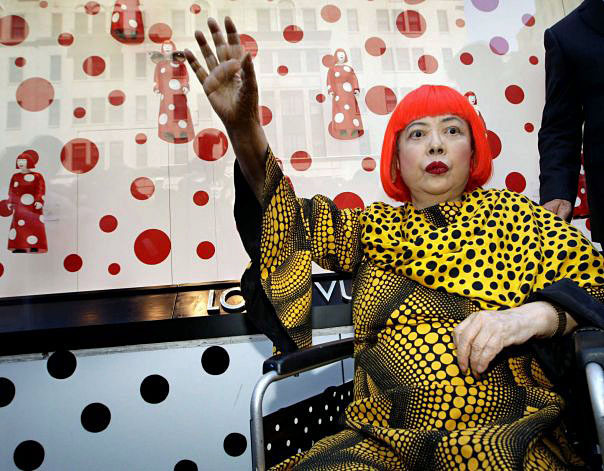 Marc, a huge fan and collector of Kusama's sculptures and paintings, originally met the creative artist in 2006, and at that time, asked if she would be interested in coming to the United States in order to collaborate on a fashion project. The result is a collection of shoes, bags, shirts, skirts, and sunglasses completely covered in dots. 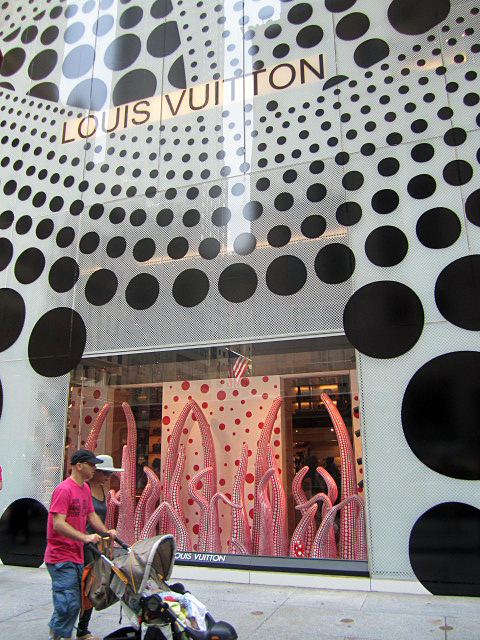 Even the facade of the store's Fifth Avenue flagship is covered in dots, as are the windows, which touch upon three of Kusama long standing themes: "Beginning of the Universe," "Eternal Blooming Flowers in My Mind" and "Self-Obliteration." There was a formal unveiling this past Tuesday and outgoing Louis Vuitton CEO Yves Carcelle was in attendance, as was the wheelchair bound Kusama. It was her first trip to the U.S. in 30 years. What was she wearing? Polka dots of course. (FYI, there is a perfectly timed retrospective of Kusama's work, at The Whitney Museum of American Art, beginning July 12th). This got me thinking about about polka dots, which never go out of style (duh! ), and which I have always loved. The late great Geoffrey Beene adored them as well and they were almost a signature, as he used them throughout his long career and if you're lucky, you can periodically find vintage versions. I happened to notice that a dealer on http://www.etsy.com/ is selling a red and white polka dot two piece skirt suit on sale ($225), and http://www.1stdibs.com/ is offering a vintage Beene Boutique navy and white polka dot dress from the 70's (the dealer is Marlene Wetherell). Some recent and quite notable examples of graphic polka dots are Celine's black and white renditions for resort 2013. And of course, you can always satisfy your craving for Mod inspired dots at (much less expensively I might add, at Marimekko (http://www.usmarimekko.com/ ), the iconic Finnish label. 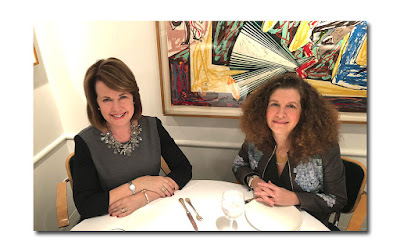 I recently visited their Flatiron District Flagship (200 Fifth Avenue, 212 843 9121) and was immediately attracted to their black and white polka dot textiles, shower curtains, aprons, tote bags, cotton napkins, and silk scarves. You will be showing lots of skin this summer so regular shaving is a must. This five blade razor has Olay moisture bars infused with Petrolatum and Glycerin, for smooth, glowing skin. The pivoting head hugs your curves and there is no need for separate shaving cream, so traveling is a breeze. Available at: Food, drug, convenience, and mass merchandise stores nationwide: prices vary. Click for more Better Bets "Sun & Fun" finds. Regardless of how serious a person you might be most of the year, the lazy days of summer are the perfect time to let go, have fun, and tap into your playful side. 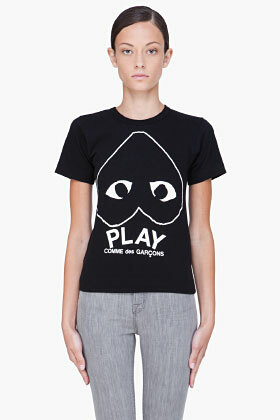 And if you, like many others, prefer that their tried and true summer basics reflect this mood, look no further than Play Comme des Garcons. 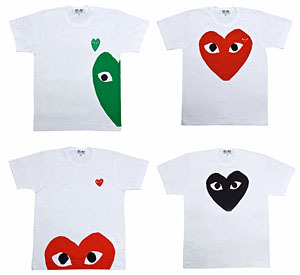 This youthful, streetwise, fun and accessible incarnation of Comme des Garcons, is the end product of a collaboration between legendary Japanese fashion designer, Rei Kawakubo, and renowned New York graphic and textile designer Filip Pagowski. It is is filled with wardrobe basics that are destined to become collector's items and are anything but dull and ordinary. What would you expect from a designer known for her penchant for turning something strange into something beautiful and sought after? 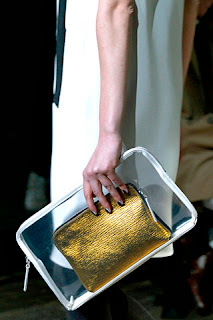 (This is what earned her the 2012 CFDA International Award). The line primarily consists of cotton t-shirts (both long and short sleeved) and wool sweaters, played out in graphic, eye catching combinations of black, blue, white, and red, with the occasional gray or hint of gold, while others sport classic stripes. 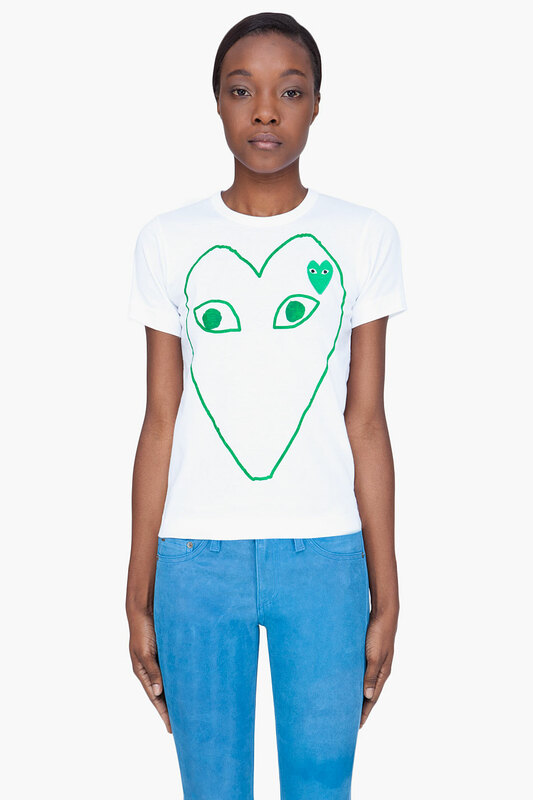 They all feature Pagowski's playful, eccentric, and endearing bug eyed heart logo (which in some cases are teeny tiny, and in others, practically cover the whole surface). 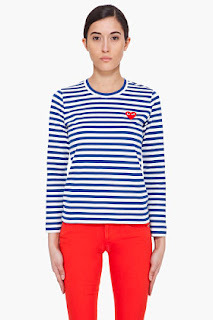 http://www.jcrew.com/ was selling a navy and white striped long sleeved cotton t-shirt ($136), though it is pretty much sold out now, except for size medium and they continue to offer toddler sizes 2,4,6 ($112); http://www.saksfiftavenue.com/ is selling a green/white or blue/white striped cotton long sleeved t-shirt ($165), a cotton jersey emblem tee and polo ($98 and $185), as well as a navy/natural striped wool boyfriend sweater, ($377); standouts on the Canadian based website http://www.ssense.com/ (with perhaps the best selection of all): the Red Eye t-shirt ($120), the Black and White Printed t-shirt, ($140), the White and Green Heart t-shirt ($145), the Black and White Heart t-shirt ($120), the long sleeved striped t-shirt in navy/white, blue/white, red/white($150), and the red emblem long sleeved wool striped sweater in blue and natural stripes ($375). Regardless of your fashion predilection or philosophy, at this particular time of the year, there is no denying the appeal and necessity of paring down, or even stripping down to the basics. But if you're going to go that route, you can't get away with dumb basics: you have to seek out wardrobe staples that fit perfectly, are made from high quality fabrics, and are tweaked just enough to make them distinctive and, more importantly, stand on their own. During these past few weeks, with the thermostat rising into the 90's, it has been almost impossible to think about piling on accessories and jewelry à la Iris Apfel. I tried but almost strangled myself in the process and decided it was just too hot to be weighed down. There is no question that a straightforward, unfussy, simplistic, minimalistic approach is the most appealing and chicest way to go. Speaking of Iris Apfel, while she may be the ultimate maximalist in terms of her bold accessories, her clothing choices are surprisingly (or not) streamlined and quite minimal. When I interviewed the fashion icon for our Masters of Fashion Interview with Iris Apfel in January 2006, I asked her what her summer uniform consisted of. She quickly replied: a crisp white shirt and jeans (boys' or men's cut jeans because she favors that cut on her frame). 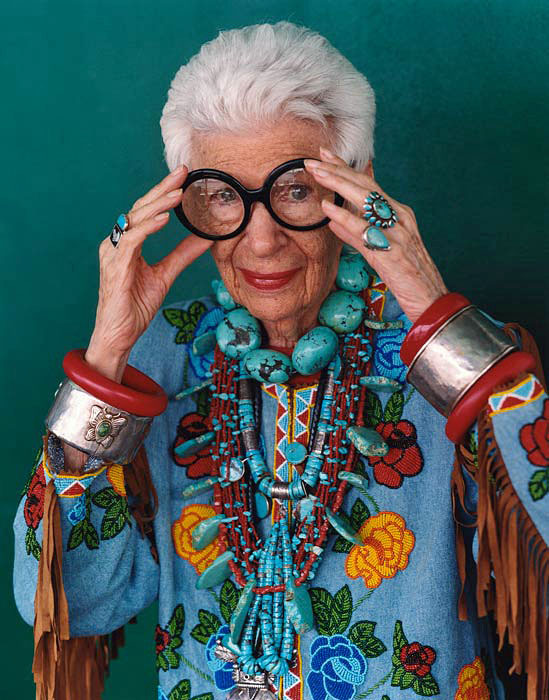 Needless to say, you can do a lot worse than to follow Mrs. Apfel's fashion advice. ﻿﻿﻿ Let's face it, nothing looks better, is less fussy and more effortless than a borrowed from the boys' white cotton shirt. And while wearing one with jeans is a no brainer, I love the hard-to-beat combination of black & white. So my choice would be to pair it with black shorts (if you can get away with them), skinny jeans, high waisted trousers, or a skirt in any length, shape, or fabric. (Although a white shirt also looks amazing with white, cream, red or orange). 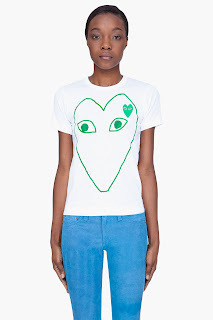 My recent favorites are a white cotton button down by Acne, featuring crystal star-shaped buttons, a pointed collar, buttoned French cuffs, and a shirttail ($250 at Barneys New York), and two from The Row (The Mikan Blouse, $790, http://www.barneys.com/ , The Pussybow Shirt, $609, http://www.farfetch.com/ ). 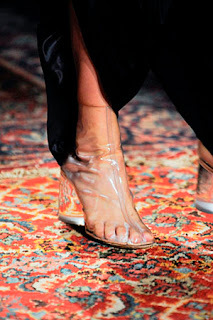 Yes, they are pricey, but considering how often you would wear them, they are well worth the cost. As for jeans, well, nothing can be more indispensable (as Yves Saint Laurent once acknowledged). But when are a pair of jeans, NOT just a pair of jeans? 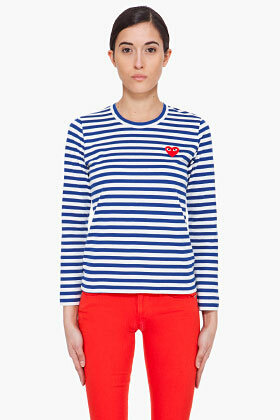 When they are Rag & Bone's Split Skinny- Black/White jeans, $198, http://www.rag-bone.com/. What I love is that they can go from day to night because they are a tuxedo pants/track pant hybrid (just change from flats to a heel and add a jacket and you're good to go. And order one size up because they run very small). FYI, with the Olympic trials going on, (and all those finely tuned, well toned bodies on view), AND the London Olympics looming in the very near future, everyone's got Olympic Fever it seems, including Ralph Rucci, who turned a sporty hooded windbreaker into a couture like collector's item, for his resort 2013 collection. I (and everyone else it seems) can never get enough of ballet flats (who wants to be uncomfortable while running around in the summer heat?) And because thunderstorms can pop-up at any time, and many of us will be heading to a beach, my favorite these days are the adorable and really practical jelly flats, which are made of rubber (not only don't have to worry if you get caught in the rain, but you can wear them in the water). Tory Burch made a jelly Reva flat several seasons ago (they came in mouthwatering colors), as did J.Crew. While you can't buy them at retail anymore, you can always find them on EBay if you keep looking. In addition to several from these designers, I also came across a few interesting interpretations (one seller is offering a Marc Jacobs inspired jelly mouse flat, $19.99). Given my fascination with see through plastic (used for bags and footwear: Ralph Rucci's customized Manolo Blahnik boots and sandals, and 3.1 Philip Lim's clutch are good examples), the most inspired incarnations I've found are the cap toe ballerina flats that combine a transparent soft jelly plastic with black patent like material (it is also available in yellow and gold) offered by one particular seller on EBay. The price tag? A hard to beat $13.59!